Having originally studied Architecture in Carlow IT, Colin opted for the more two dimensional Graphic Reproduction in DIT. He worked in a large Dublin agency for 4 years, before setting up Unthink in 2006. Along with partner Noelle Cooper, their team of five focusses on design for print, web and beyond. Their work has featured in a variety of international publications and has become a regular fixture in the 100 Archive. Clients include: Design & Crafts Council of Ireland, Irish Architecture Foundation, Galway 2020, National Museum of Ireland, Kinsale Arts Festival, Design Week, Offset Festival, Irish Design 2015, Pivot Dublin, Dublin Institute of Technology, Maynooth University, Dublin City Council, Ibec, RPA, Grangegorman Development Agency, Donal Skehan, Sharon Hearne-Smith, Fish Shop, Press Up and Plan International, to name a few. 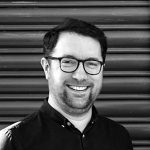 Colin is also a visiting lecturer on the MA Professional Practice and BA Visual Communications in DIT, and recently mentored on the Design West summer school in GMIT Letterfrack.